One could probably not survive eating nothing but potatoes, but it might be fun to try. There can scarcely be a more fundamental vegetable to grow. Gardeners often grow different varieties for baking and for boiling (as for use in salad) since the qualities that make a potato excel for one purpose differ from those wanted for the other purpose; there are, though, some pretty good multi-purpose spud types. Because both climate suitability and—in this commercial potato-growing area—resistance to diseases are important, we need to be careful. We need to look for earliness, keeping qualities, heat tolerance, productivity, and disease resistance, as well as, of course, flavor and best uses. After extensive research, it looks to us as if there is a clear winner: Yukon Gem, a significantly improved descendant of the already classic “Yukon Gold”, with substantially improved yields and significantly more disease resistance (including resistance to blight). The penalty (vs. Gold) is a small one: about 10 extra days of growing time, making it an 80- to 100-day crop; but, as potatoes (despite being Solanaceae) are a cool-weather crop, that’s not a big deal. The Yukons are medium-sized spuds with a yellow flesh (which retains that color in cooking) and a flavor often described as “buttery” (whether that is actual or a psychological effect of their color is uncertain, but the comment is common). They are well suited for all potato uses (though perhaps less then ideal for frying as chips, still quite usable). Potatoes are always grown from cut-up bits of potato. In theory, one could buy a potato at the local supermarket, cut it up, plant it, and get potato plants; the theory more or less works, but is a very bad way to go about growing potatoes. The only right way is to buy “seed potato” (whole potatoes grown for use as “seed”) from a thoroughly reputable (and state-certified) seed-potato supplier, preferably a specialist (there are several who deal with the home-gardening market). The greatest risk otherwise is disease, which an apparently sound potato can carry. Ideally, one prefers seed potatoes grown in certain climates, those in which the diseases to which potatoes are prone are rare; generally, that is in the north (which is why all the northern-tier states, from Maine to Idaho to Washington, are the major potato-producing states). (We use air temperatures because that’s the detailed data we have; the better measure is soil temparature: you don’t want to plant your spuds till the soil temperature reaches at least 45°. Monitor it closely, because you want to get them in the ground as soon as you can without risking rot at the start or heat burn at the end. The calculation: 100 square feet is 14,400 square inches; a 1" depth of water is thus 14,400 cubic inches, which is 8.333 cubic feet. Water is 7.48 gallons per cubic foot, so a one-inch depth of water over 100 square feet is 1.117 gallons. Of course, you also need to know how many plants you have room for. Jeavons, in his deep-bed book, set 9 inches as the spacing, as noted above. More conventional advice, for gardeners who do not use deep-dug or raised beds, is 10 to 14 inches of spacing in rows a couple of feet apart. (That may give you a clue as to why deep-bed gardening is so much more productive for the square footage of garden.) 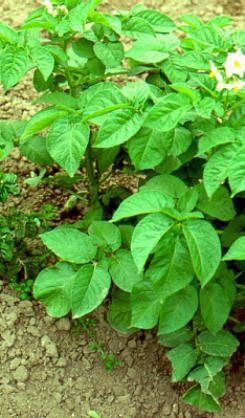 If, for example, you are dedicating a 4' x 16' bed to potatoes, you can plant 5 across in a row, and 21 rows down the bed, for 105 plants; which would be 8 to 13 pounds of seed potato, depending on your per-pound rate. The thing to do your first year would be (for a bed that size—pro-rate for your bed’s size) buy 10 pounds, see how many plantable eyes that yields you, and space the plantings evenly to accomodate that number; then, in future, adjust your order so as to get the wanted number of plantable eyes. For the space-challenged, there are other ways of growing potatoes: some form of what is often called a “potato barrel”, though the actual container is rarely an actual barrel. Do be aware that while this is a great space saver, most sources feel that the yields per eye seed do not match those available using a real bed. Potatoes are of the wonderful Solanaceae (or nightshade) family, as are peppers, tomatillos, tomatoes, and eggplants, among others. Tomatoes and potatoes are so close botanically that someone once (in the ’70s) developed a cross—the pomato—that bore tomatoes above ground and potatoes underground. Sad to say, the quality of both was fairly poor, and the thing never caught on. But it’s a tribute to ingenuity. A fascinating review of the world of potatoes is available at The Potato Museum. It was last modified on Saturday, 2 February 2019, at 18:00 EST.